This television documentary film tells the inspiring story of Christian Picciolini, a former leader of the White Supremacist Movement now combatting hate, featured on 60 Minutes, CBS, CNN and MSNBC. The film also features Mark Potok, the Senior Fellow at the Southern Poverty Law Center, our partner organization at the forefront of monitoring and combatting hate. 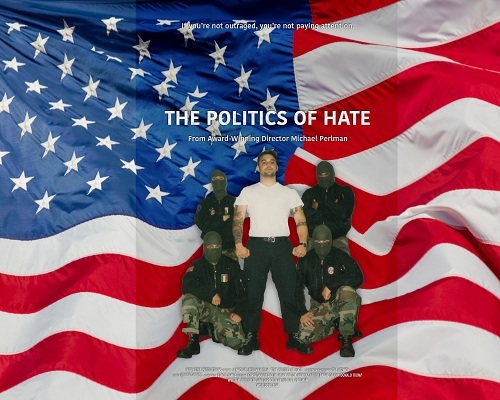 From the award-winning director Michael Perlman comes an incredibly timely film The Politics Of Hate that documents the last hundred years of hate in the USA and the interconnection between the American and European far right movements, supported by the Russian government. The film explores the current Western political climate, chronicling the rise of the far right in the US and Europe, and giving alarming insights into the ways the alt-right movement operates. It goes on to examine the interconnection between fascist ideologies in the U.S. and Germany that led to the Holocaust straight through to the white supremacist marches in Charlottesville. The film highlights a hopeful message of a historical pattern of great progress met by a fierce backlash that ultimately results in a better future. The documentary also features Menhaz Afridi, a Muslim American woman who serves as an advisor to the US Holocaust Museum and the Director of the Holocaust, Genocide and Interfaith Center at Manhattan College. The US Holocaust Museum and the ADL were helpful in the making of the film. Proceeds from the film go to Southern Poverty Law Center.